This topic contains 31 replies, has 9 voices, and was last updated by OldBen1 3 days, 16 hours ago. Well, it’s 2019 and it seemed like a good time to restart my Blade Runner project. I only have 2 projects on the go so I should have the time. I have been recently inspired on the forum to try and run a game of the Department solo. I actually started this project 4 years ago when I was able to order the incredible Blade Runner pack from the now closed Effigy Miniatures. I liked Deckard and Bryant, but the actual replicants themselves were a little slim and strange. After B.R. 2049 I began thinking about restarting, and perhaps using the Department as my rule set. It definitely needs a bit of tweaking, I especially like the section on investigation . Now as always I have a limited budget and space. I’m going to use my 2D Sci Fi rpg tiles to start. I may invest in some buildings later. Now for the finished miniatures! 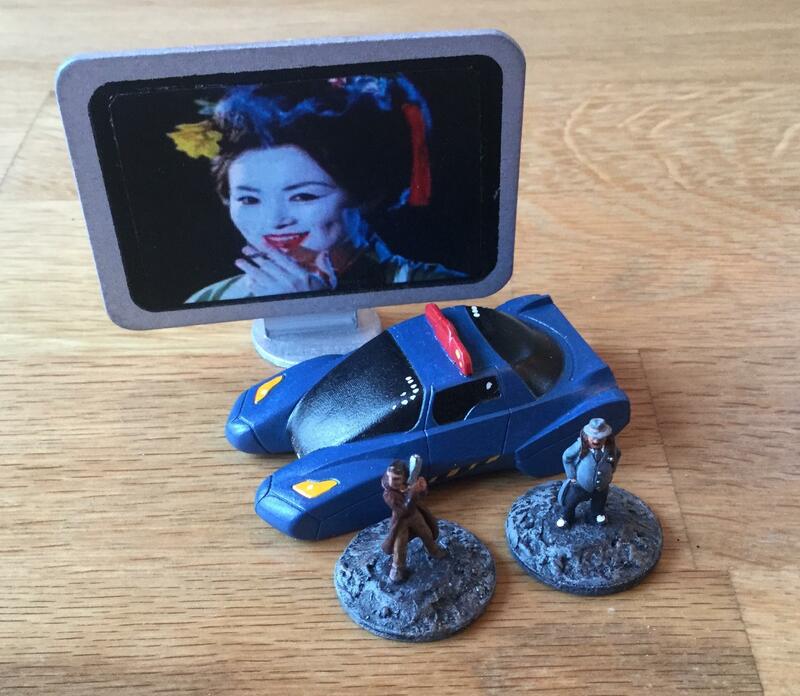 Here is my set of noir investigators. I did some trading with the Painting Agency for these. Allison is a wonderful painter. Deckard and Bryant. I will probably use them as npcs. 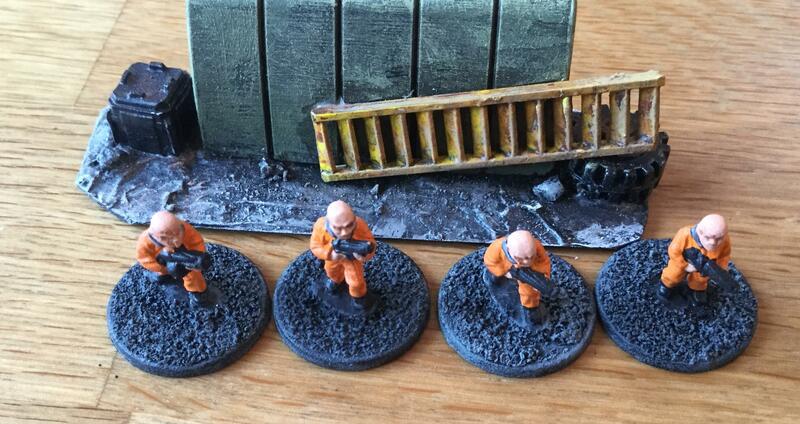 Here are some escaped off colony mining replicants. This topic was modified 1 week, 6 days ago by OldBen1. Interesting. There’s a lot of 15mm out there and you could add all sorts of weirdness considering the first movie. It’s 2019 and we still don’t have hover cars. 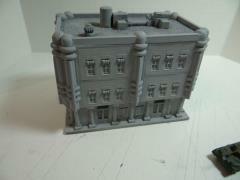 I found these buildings by JR miniatures today. They are 10mm but look awesome! This reply was modified 1 week, 6 days ago by OldBen1. Nothing is worse than having in itch you can never scratch! A great project! 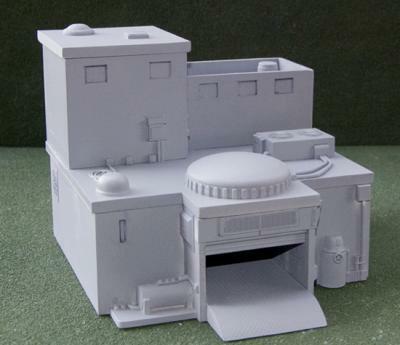 You know, some of the paper buildings from Dropzone Commander are still available various places and have a decidedly Blade Runnerish vibe. 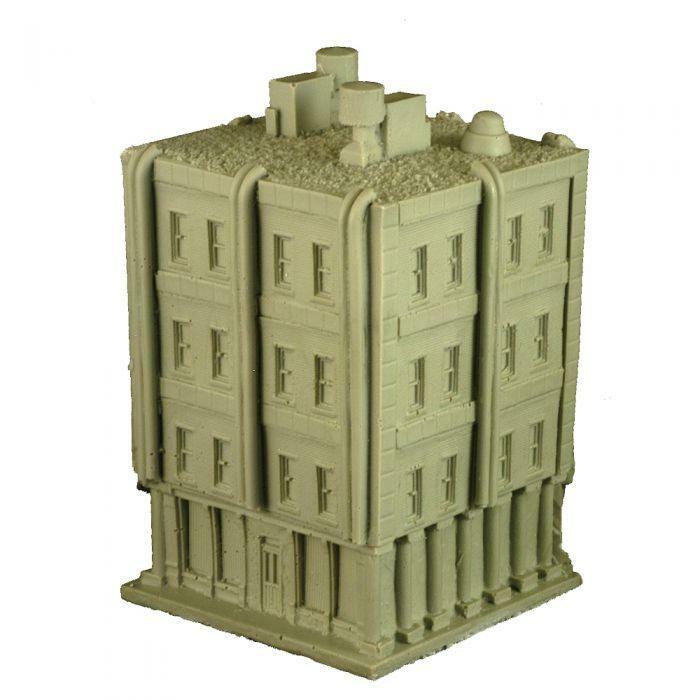 As do the Iliada lasercut buildings – Ali might be convinced to do his 6mm Retrofuturist City at 15mm scale for you. Good looking start! If you need another spinner, got one here called the Outrigger ( https://www.darkeststargames.com/spec-sec-vehicles.html ), and another will soon be released. What rules will you be using? I’m going to be using “The Department” by 4 Color Games. I like your sci-fi cars much better than Khurasan’s, but I had to make quite a large order to get the minis I needed. I do love me some The Department! (as evidenced by my previous excitement over some posts here!) Can’t wait to see more more more more! I feel ya. I forget, are you in the UK? I’m in Canada. I really wanted the Noodle Bar from Khurasan. To save money I ordered their cars as well. I like your cars a lot better, but maybe next time. I do love me some The Department! (as evidenced by my previous excitement over some posts here!) Can’t wait to see more more more more!.? 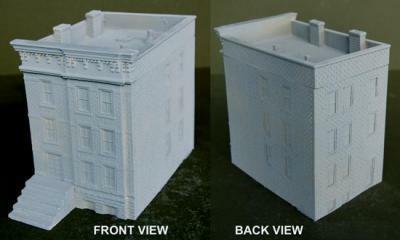 If you’re looking for buildings then this one from White Dragon Miniatures is good for the crumbling ‘near future’. This reply was modified 1 week, 5 days ago by Etranger. Ya, the White Dragon building is very nice. Wish they had more variants. Very “Elysium” to my eyes. How many cars do you currently have, OldBen1? Unfortunately the buildings are going to have to wait. I’ll need a serious influx of birthday cash. I’m thinking about either the Jr, miniature buildings (cheaper) or maybe mixing the sci fi blue moon with some of the gangster range as well. I’ll just add some pipes for “The Yukon”. I have 2 cars. 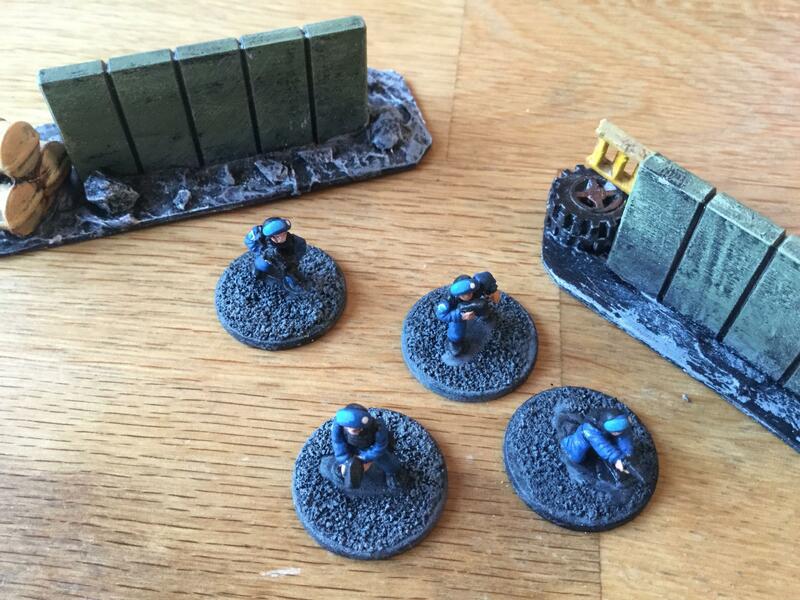 I was hoping to do more of a mining outpost board using my sci fi tiles. This reply was modified 1 week, 4 days ago by OldBen1. Added some Nexus 6 for the Blade Runners to battle. Here are some Fabricants. I am going to treat these as earlier Nexus 2 models. I really like that 2nd building, reminds me of a desert themed battlebot video game that died in production. If you’re looking for inexpensive, you could get some of the laser cut card buildings from Illiada Game Studios. 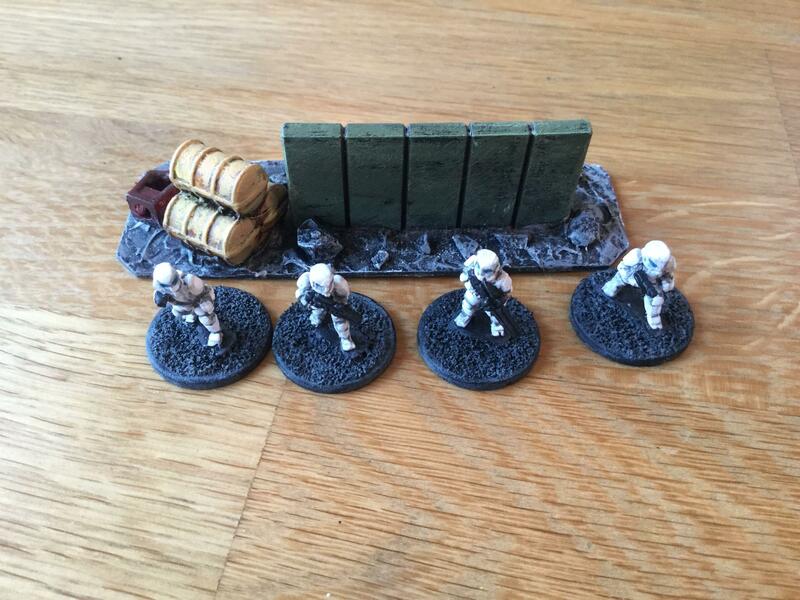 I have the 15mm outpost set and some 6mm buildings and they really hold up well. He also has scifi doors and windows and other bits that can easily be applied to anything to make a building, like electrical boxes or old cardboard shiz. Say, drop me an email (info [email protected]_ darkeststargames _dot_ com), got a batty idea for you! Anywhere I can read a review of “The Department”? The name makes it difficult to search for. You have to scroll down quite a bit but there is a ton of info. It’s a strange game, but seems pretty sound in terms of it’s mechanics. I am going to midify it for sure. The main schtick is the goal system. Characters throw dice and hope to reach a certain number of goals. This either makes something a stellar success or a miserable failure. There are quite a few scenarios as well. Forgot Micropanzer!!! If you contact Jason he has a vast array of resin scifi doors, windows, HVAC and doodads too for making custom buildings from whatever. 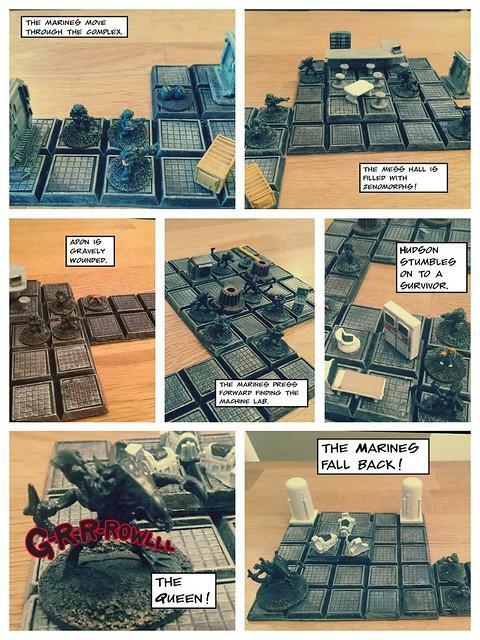 Cool project, the Department was a neat game and the minis had lots of character. I was sad to see Ghosts of Hefei fizzle out. I missed the kickstarter, and it never got a commercial release. This reply was modified 1 week, 2 days ago by Logain. I love this project. 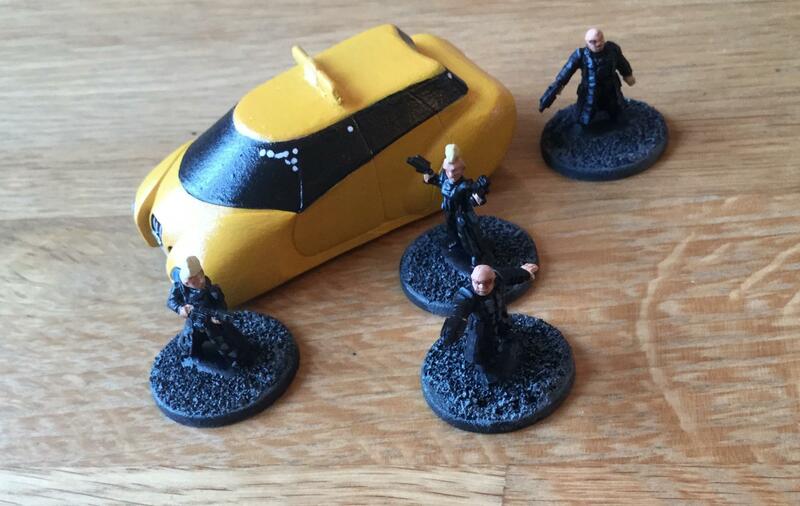 If you don’t mind my asking, who makes the Nexus 6 chaps – the bald ones (+mohawks) in overcoats? I was sad to see Ghosts of Hefei fizzle out. I missed the kickstarter, and it never got a commercial release. i was sad to see it not catch on either. I did the KS for the 15mm minis, and it took so long to deliver I thought it was just plain dead. 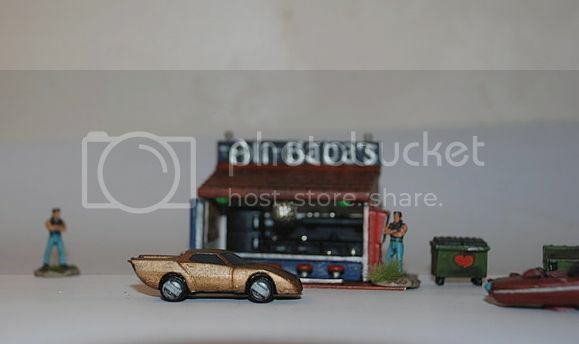 The minis are cool, thought shallow on detail as is PF’s style. And the rules aren’t bad at all. I like that you can hack various nodes around the tabletop to do things, like move robo-forklifts and the like. I really do wish they’d get back on the horse, if even just for the love of their own games. Here comes the Fuzz! The department needs some cops to support the Runners. Not in keeping with the movie police officers, but I figure they look cooler anyways. Very Robocop. The Nexus 6ers are from Khurasan. After re-reading the rules I am going to heavily modify the rules. -I like the goal system and combat. I like the character stats as well. -The huge table with 6 buildings a ton of bystanders is not going to work for my 2D tiles. I want dark alleyways. -I want more action. I will have to change some of the A.I. tables. -I am going to link the story to the evidence. I am going to create a rough story where the characters must look for evidence. Like a choose your own adventure I want the characters to follow the leads and have the evidence drive the story. Do they find a reliable witness? Do they come across some financial records? Do they find a footprint on the carpet? Now on to scatter terrain. 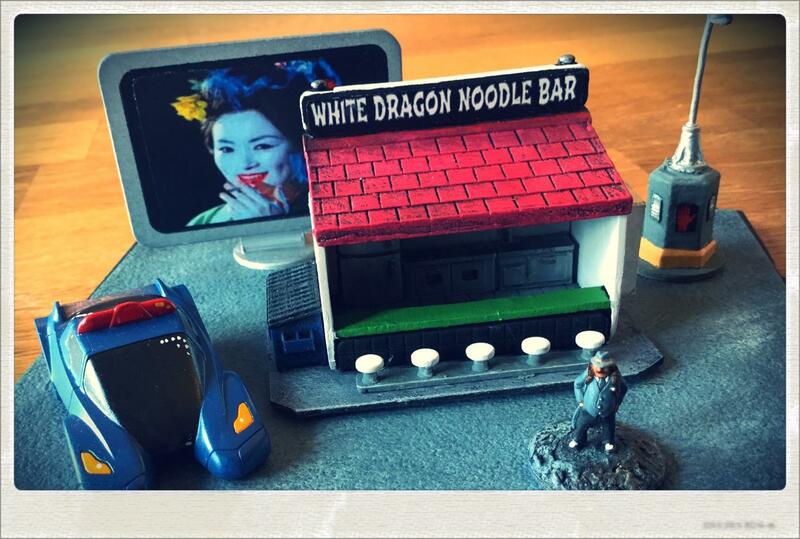 I have a noodle house to build and paint! This reply was modified 1 week, 1 day ago by OldBen1. Who makes the bald guys in the overcoats? Please? Working on some scatter terrain. I was going to save this one for last but it looked too fun! 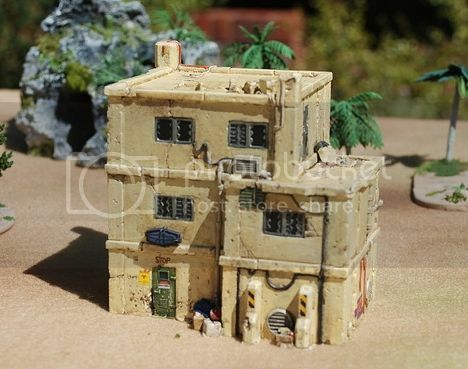 It’s the snack shack from Khurasan miniatures. That noodle shop came out really well. As I was reading some of your notes on the rules it occurred to me to ask whether you’ve ever taken a look at any of the Two Hour Wargames rules: either Larger Than Life (Pulp) or 5150 (Sci-Fi) might work almost perfectly for this sort of project. The campaign rules are also based on clues, there are plenty of dark alleys possible, and most important, the action seems to be a few ticks above what The Department tends to generate. Though I haven’t seen them, I’ve come across several AARs online that speak of Department campaigns finishing without a shot being fired, which to me sounds rather underwhelming. I suppose it depends what sort of gaming one prefers. Anyway, at the very least you might find some inspiration in THW’s stuff. May I trouble you to ask who makes the dapper fellow in the spats? And the bald guys in orange jumpsuits? More Khurasan? This reply was modified 1 week ago by Gone Fishing. The guy with the hat is from effigy miniatures. They are no longer selling. The bald guys are from Brigade models. Ive only read the zombie rules from THW. It might be worth a look. Thank-you. Well I ended up buyig 5150 a New Hope. I really enjoyed all the investigation tables. I am beginning to think I may have to write out my own set of rules. The department is too huge for quick games, and there is not enough action. 5150 has some great tables to help direct the clues. This reply was modified 4 days, 20 hours ago by OldBen1. I finally got may agents in the mail. I’m hoping to get the rules done this weekend. I have an introductory adventure set in 2009. I’m going to use some older vintage models for the adventure.